Adventure bikes and their accouterments have evolved significantly over the last decade, allowing us to ride farther, more safely and in all-season comfort. Most agree that after the bike itself, a helmet is the most important purchase decision we make. Not only is an adventure helmet the guardian of our vital gray matter, it’s also a top contributor to comfort and concentration, including temperature regulation and our ability to stay focused. Poor ventilation, noisiness, weight and lack of functionality can be major killjoys. Lucky for us, helmets are constantly evolving, especially the adventure hybrids, defined by their dirt shell configuration, aerodynamic full-face shield angle and adjustable/removable peak. 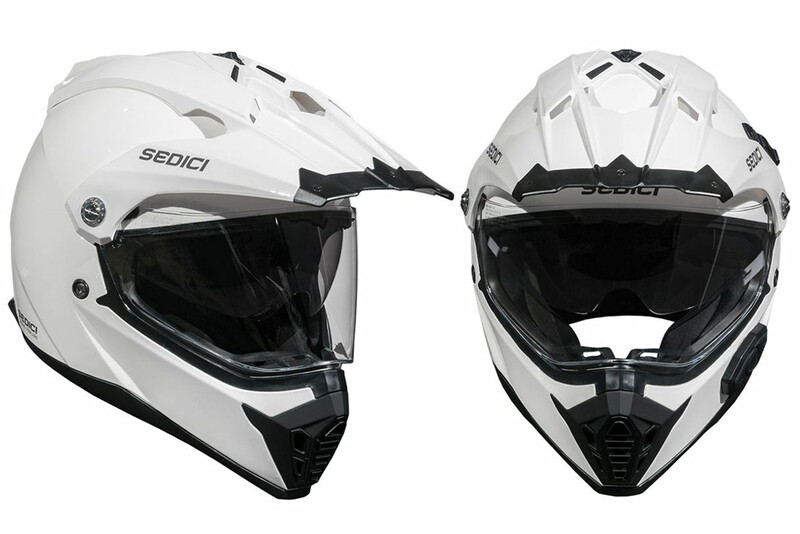 Additionally, the perfect ADV helmet will be stable at high speeds, well ventilated, lightweight and goggle friendly. 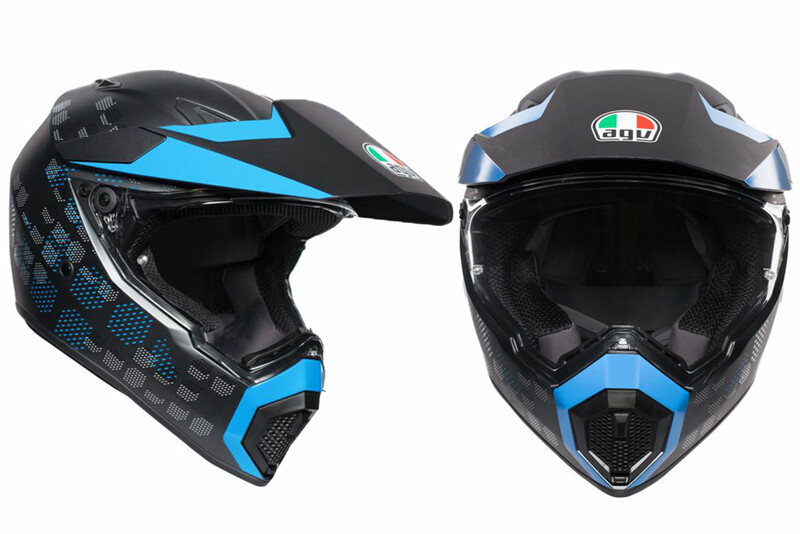 For 2019 AGV is finally offering a completely redesigned version of its adventure helmet in the AX-9 and AX-9 Carbon, replacing the AX-8 DS EVO. The new design is much more street-friendly than its predecessor, which was essentially the company’s AX dirt helmet equipped with a face shield. Yet while the new AX adventure helmet is now claimed to be 80/20-percent on-road to off-road oriented, it’s still lightweight (the carbon version weighs just 3.5 pounds) and even more aggressively ventilated with five channels and a fully removable chin vent plate. Important new features include a reconfigured facial frame that offers 90 degrees of horizontal vision and 110 degrees of vertical vision, a larger peak with improved aerodynamics for stability and a refined peak removal system. The soft, moisture-wicking lining is still removable for easy washing and even better, the interior is now communicator friendly with recessed pockets for speakers. The standard AX-9 is DOT and ECE approved and comes in solid black or white for $499.99. Two- and three-tone schemes are available for $549.95, and the super lightweight carbon version in black only goes for $649.95. Klim was a cool Idaho-based niche brand until it was purchased by Polaris Industries in 2002 and catapulted into ADV apparel stardom. 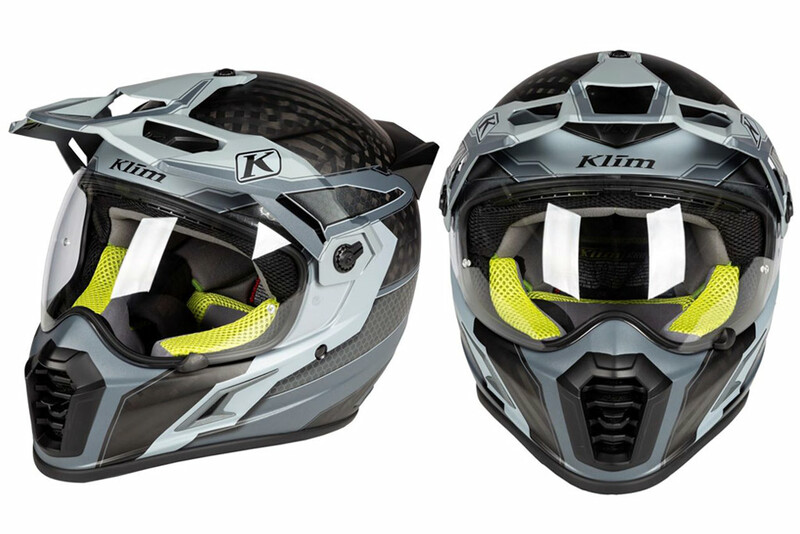 The latest adventure helmet offering from this mainstay company is its flagship Krios Pro, claimed to be the most versatile motorcycle helmet on the market, offering four distinct ride modes: ADV, Dual-Sport, Off-Road and Street. The shell of the Krios Pro is constructed of hand-laid carbon fiber and comes in either matte black or the “Arsenal” gray or tan versions for the same cost. 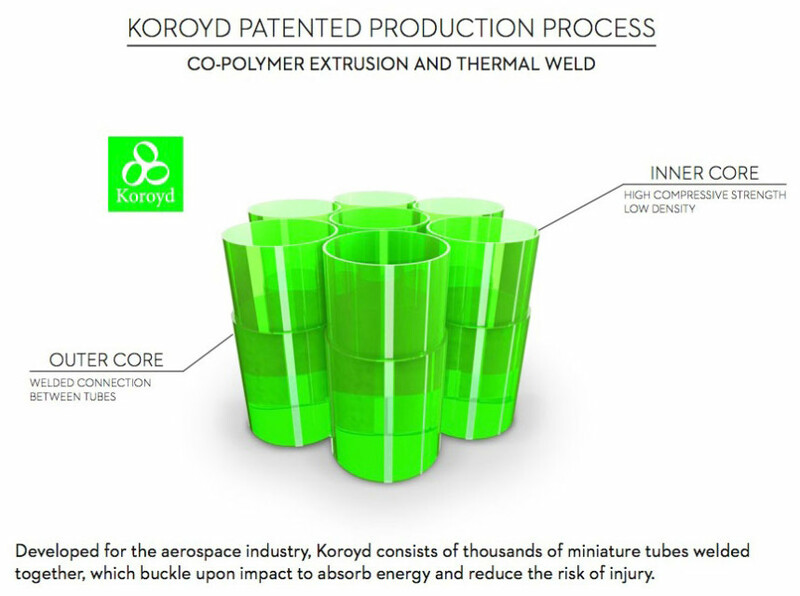 For improved impact absorption, the Pro now features a high-tech Koroyd interior. This material employs thousands of co-polymer extruded cells designed to crush on impact, dissipating energy to reduce trauma to the head. Comfort and convenience features include an anti-microbial, moisture-wicking lining, plus new adjustable forehead and chin vents, and magnetic, quick-release chin strap. 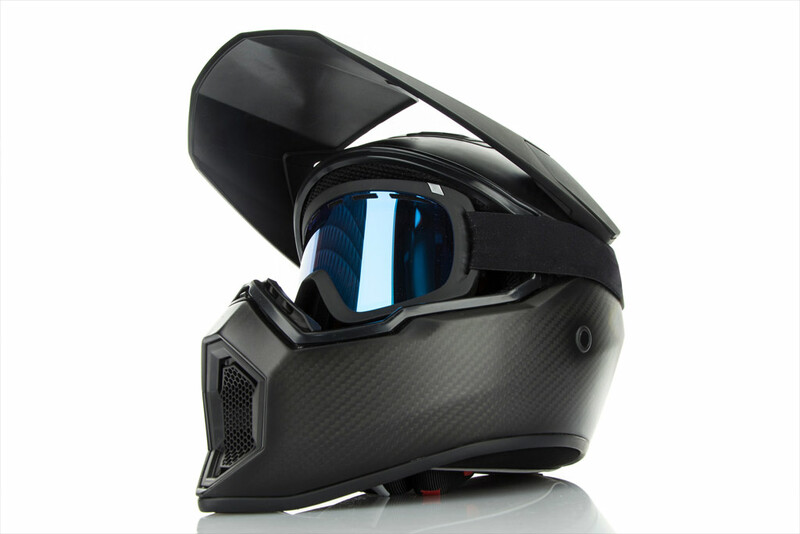 The Krios Pro adventure helmet is ECE and DOT approved and now comes standard with a Transitions auto-tinting on a pin-lock ready shield that’s removable without tools. A new visor has been engineered to improve airflow and stability at high speeds. Talk about bang for the buck. Here’s an adventure helmet with the functionality of a top-shelf model that comes with integrated Sena communication technology for under $250. Sedici is the Italian word for sixteen and Viaggio Parlare loosely translates to travel/talk, making some hope this brand comes from Italy when in reality it’s a Cycle Gear-owned label, hence the enticingly high benefit-to-low-cost ratio. As you’d expect the Viaggio Parlare’s construction is pretty basic. The shell is injection-molded ABS and its “comfort liner” is removable and washable. There is ventilation at the chin bar only. The peak is removable and the shield is touted as “quick release.” A separate inner sun visor can be raised and lowered via an external toggle. 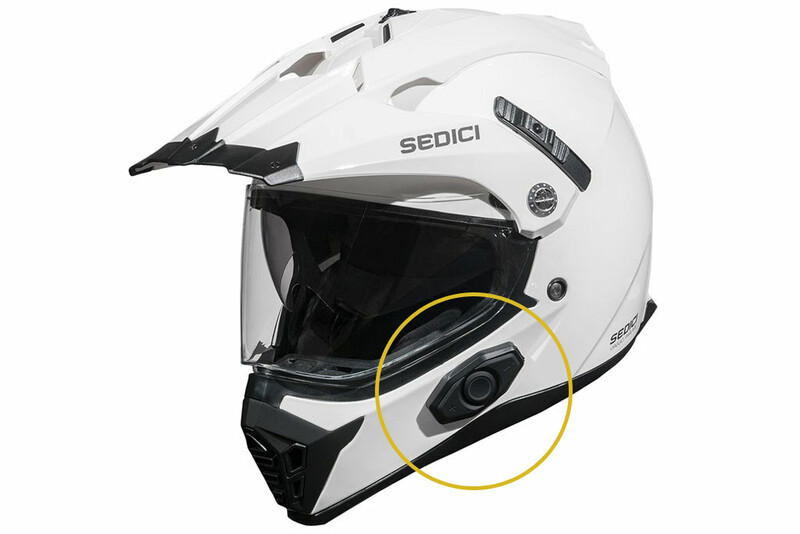 This adventure helmet’s top selling point is surely the built-in Sena DWO-5 bluetooth v3.0 system, which integrates hands-free phone communication and universal intercom compatibility. Using your connected smartphone you can listen to music or receive turn-by-turn navigation. Noise-cancelling technology is said to help cull wind noise for voice clarity. The DOT approved Viaggio Parlare is available in white or black, and you can also get the standard version of the Viaggio Adventure Helmet without Bluetooth communicator for $119 in Black, White or Yellow.